The Miller® T94™ welding helmet with light kit features Miller's ClearLight™ auto-darkening lens technology that provides a bright, crisp, clear view of the weld puddle. The T94 is designed to perform in high-heat*, industrial welding applications. 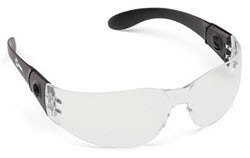 The matte silver finish reflects heat while the aluminum heat shield protects the auto-darkening welding lens. 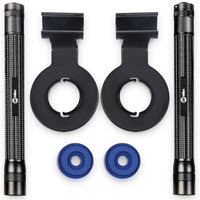 The lens operates in Weld, Cut, Grind and X-Mode™, which is ideal when welding with low amperage DC TIG, with obstructed views of the weld arc or while welding outdoors. It is capable of DC TIG welding down to 3 amps and has four arc sensors. The lens also features external grind controls, which means you don't have to lift the helmet to switch from welding mode to grinding mode. whats the difference between the T94 and the T94i? Does the T94 with light kit have an opening visor or does the whole helmet rotate up on the head gear? 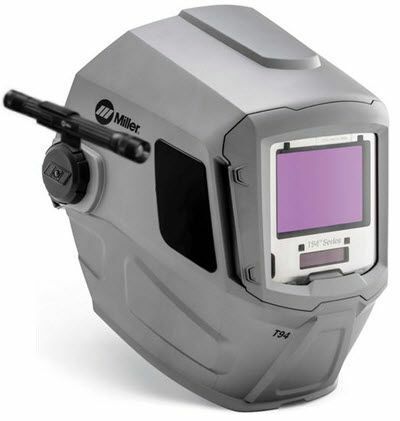 Correct, The Miller® T94i�"� welding helmet features integrated grind shield with 44 square inches of clear grind shield viewing, all your grinding and other non-welding tasks can be performed quickly and safely.